The ice sheet retracted from northern Europe allowed for the colonisation of the Scandinavian Peninsula from about 9700 BC, according to the archaeological record, both in southern and northern Scandinavia, while ice still dominated the interior. The peninsula seems to have been colonised first from the south by peoples from central Europe, related to late-glacial lithic technology (direct blade percussion technique), which brought WHG ancestry with them. Komornica traditions from western Latvia show technological similarities with the western Baltic region, shared with Maglemose cultures across the Polish Plain to the islands of eastern Denmark and southern Sweden, where the core platforms were generally kept unprepared, and formal microliths were an integrated element of the lithic tool tradition, suggesting that the pressure blade technology was not adopted completely (Damlien et al. 2018). An invasion from the north-east (through Finland) by post-Swiderian Mesolithic groups from east Europe is evidenced by the arrival of EHG ancestry with them. Their technology is represented by their pressure blade technology in central and western Scandinavia, where the core platform was formed and repeatedly rejuvenated by detachments of core tablets, and by systematically faceting the platform surface. Formal microliths are generally absent, and blade inserts dominate. This is clearly documented in Zvejnieki II, in northern Latvia (Damlien et al. 2018). This regional variation in pressure blade technology is an expression of two different culturally derived traditions that existed synchronously in the Northern European Plains and around the Baltic Sea during the Middle Mesolithic (Figure 6). 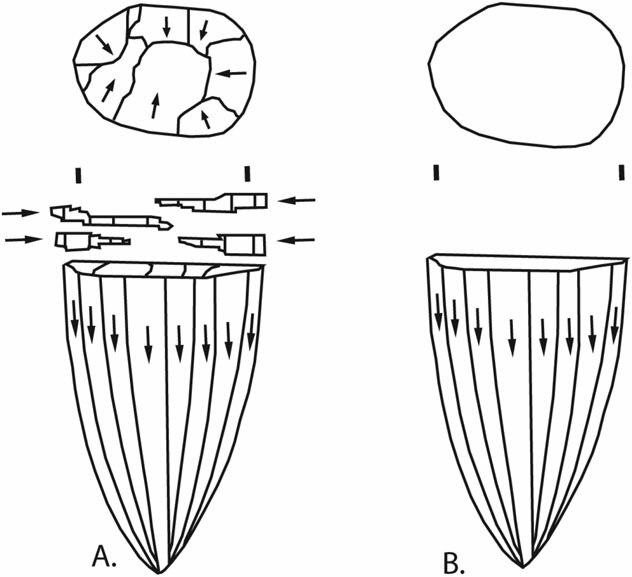 The adoption of the earliest form of pressure blade technology in Maglemose/Komornica (dating to the early Middle Mesolithic in post-Swiderian cultures) points to the adoption of technology by western groups, and thus to the existence of two main distinct cultural, economic, social, and communication networks in northern Europe (Damlien et al. 2018). Figure 6. Different types of core platform rejuvenation and preparation. A: Platform preparation by systematic faceting and repeated rejuvenation. B: Unprepared platforms (modified after Sørensen et al. 2013, fig. 1). Image from Damlien et al. (2018). These population movements left a paradoxical pattern of increased EHG ancestry in northern and western Scandinavia, and WHG ancestry in eastern and central Scandinavia, which correlates with Baltic samples (Suppl. Graph. 3). It has also been shown that selection drove the unique combination of light skin and hair and varied blue to light-brown eye colour, as part of the adaptation to a different environment, contrasting with WHG who had the specific combination of blue eyes and dark skin (Günther et al. 2017). Individuals from Mesolithic Scandinavia, which define the so-called Scandinavian hunter-gatherer (SHG) ancestry, show exclusively I-M170 subclades, probably resurged from the previous Magdalenian-Hamburgian expansions, and mtDNA haplogroups U5 and U2 (Mathieson et al. 2017). The first sample of haplogroup I1-M253 is probably found in Gotland ca. 6950 BC, which points to the survival of these lineages in pockets of Scandinavia until the formation of the Nordic Late Neolithic. The expansion of the pressure blade technology proper of post-Swiderian cultures was also driven by I2-M438 lineages, which probably ‘resurged’ in certain Baltic communities at the end of the 7th millennium, side by side with hg. R1b1a1-P297. For example, Zvejnieki hunter-gatherers show six individuals of hg I2-M438 (ca. 6000–4775 BC), with two I2a1a-P37.2, two I2a1b1a2-CTS10057 (formed ca. 8500 BC, TMRCA ca. 8500 BC), and two I2a1a2a1-S2639 (formed ca. 5000 BC, TMRCA ca. 4700 BC). The assemblages of Motala hunter-gatherers from south-western Sweden, for example, have been described as having general traits in common with Maglemosian cultures (e.g. microblade technology), but differ in other respects (e.g. an absence of geometrical microliths), with further similarities and differences with the “quartz and pecked axe complex” found in north-east and central Sweden. Because of that, it is considered a transition zone, a mixture of cultural contacts (Eriksson et al. 2018). The east–west and north–south mixture of ancestry and lineages in Scandinavia is thus further complicated by cultural contacts. Motala hunter-gatherers, sampled since the 8th millennium up to the 6th millennium BC, show mainly I2a1a2-M423 lineages (formed ca. 16400 BC, TMRCA ca. 9200 BC). An individual of eastern pressure blade technology from Huseby Kiev (ca. 7800 BC) shows mainly WHG ancestry, belonging to the south-eastern SHG group, in spite of its culture belonging to the expansion from the north-east, which may support cultural diffusion, but also (probably more likely) the gradual admixture during the population expansion, and later population replacement from the south (Kashuba et al. 2018). The same WHG-related ancestry is found in another sample of Maglemosian culture from Stora Förvar (ca. 6600 BC), and in an individual associated with handle core technology from Motala (ca. 5640 BC), which supports continuity of this ancestry in the region. Furthermore, it seems that EHG ancestry did not reach southern Denmark before the Neolithic (Jensen et al. 2018).